In examining all of the elements of parable interpretation, the parable of the Lost Son will be examined like a diamond – looking at all the different facets and angles to determine its unique interpretation. In those days, it was the eldest son’s responsibility to reconcile relationships between the children and their father. The fact that the eldest son refuses to enter the celebration of the returning son was also an insult to the father. The eldest son’s anger is emphasized here because of this choice. The eldest son also greatly disrespected his father. b. In looking at the context of Luke 15:1-10, Jesus uses two other parables building up to the parable of the lost son. Luke starts the chapter by acknowledging that there were sinners, tax collectors, and Pharisees present while the parables were being told. First Jesus tells the parable of the lost sheep. I imagine it raised a few eyebrows as Jesus admits that he would leave 99 sheep on a dangerous hillside in order to seek out a lost one. The listeners begin to understand the depth he would go to see that the lost are found. Then he follows it up with the parable of the lost coin. The lost silver coin was worth about 1 day’s wage. The listeners eyebrows may have been raised again as Jesus says that a woman throws a party for all her friends just because she finds her lost coin. The Pharisees and tax collector might have been starting to understand the celebration and rejoicing that occurs when someone who is lost is now found in the Kingdom of God. Then, Jesus illustrates a most shocking parable of all, filled with vast contrasts and cultural fopaux’s. This parable challenges their deepest sense of justice and replaces it by Jesus’ mercy and grace. In the chapters before and after Luke 15, Jesus continues to challenge the Pharisees’ paradigms of who will be allowed into the Kingdom of Heaven. He is blatant in his approach in the parable of the great banquet by explaining that those who make excuses and live by rules will not be invited to the banquet at the end of the age. Luke’s theme throughout his book parallels the concept of sinners entering the kingdom of heaven. This parable (and surrounding parables) is no different. Luke includes this parable as one of Jesus’ finest moments of shock as he challenges some of the Jew’s deepest beliefs. c. Internal elements. In looking at proportional comparison in this parable, we see that the tenor is sinners:Jesus and quite possibly law:grace. 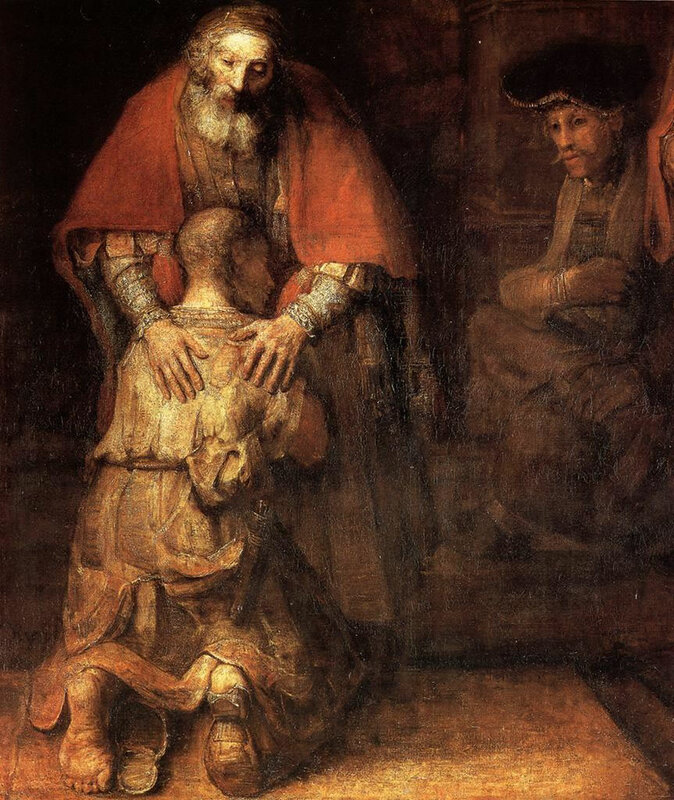 The vehicle he uses to portray this is the relationship of the lost son to the father, and the comparison between the two sons (law and grace). The point of resemblance is that Jesus welcomes back even the worst of sinners and restores them to their rightful place within the kingdom. The diction Jesus chooses I find quite interesting. His choice of words over describing the return of his son was unique. He says, “He was dead and is alive again, he was lost and is found.” By using the contrast of dead and alive, Jesus refers back to the Jewish tradition of a son accepting a father’s inheritance before its proper time. As said before, the son would have been “dead” to the family as he shames their name and removes himself from their support system and covering. Jesus shows complete restoration by using these words. He follows it up with saying he was lost but now is found – the theme of Luke 15. He ties the story in with the rest of the chapter, signifying that Jesus is again elated when one of his lost ones are found. Jesus appeals to their pathos (emotions) in this story by displaying such a stark contrast of sin and forgiveness. To the tax collectors and sinners listening, their emotions would have been stirred to hear that there is a God who forgives, even the worst of sinners. To the Pharisees, their pathos would have been challenged in anger and frustration over the lack of injustice, yet the sweet display of reconciliation. Jesus sets the stage in this story by using key words to describe the setting. He explains that the son went off into a distant country, famine in the land, working on a pig farm, etc. These descriptive elements help create a mental picture of the son’s immorality (especially detailing out that he worked with pigs, an unclean animal). Jesus builds the plot of the story up as it culminates at the point where the son has hit rock bottom. He desires pig food because he wasted all of his money elsewhere. As the story concludes and the father accepts back his lost son, a sub-plot emerges as tension arises between the eldest son and the father. That plot concludes with the son living in anger and refusing to celebrate his brother’s return. This parable is told from a third party-perspective. It narrates both the two sons and the father. Because this story was meant to touch different groups of people each relating to different characters, the point of view can be seen from multiple perspectives. The Pharisees undoubtedly related to the eldest son, where as the tax collectors and sinners related to the lost son. In analyzing the characters of the story, you see that the lost son was demanding, selfish, and had “lost his senses.” The father was forgiving, loving, a good businessman, and longed for all of his sons to partake in celebration. The eldest son was a hard worker, responsible, just, and lacking in grace and mercy. The eldest son was also jealous, constantly comparing himself to his brother, disrespectful, and self-centered. The father’s relationship with his youngest son was torn, broken, and lifeless, until he comes home. Restoration happens and all is forgiven. However, it seems as if the eldest son always tried to please his father out of duty, but never out of love. There is tension over jealousy, but the father longs for both of his sons to be restored, so he pleads with his eldest son. He explains to the eldest son that he actually had received more than his brother because since he remained with his father, he was able to bask in the all his father’s wealth. The son, unfortunately, remains hard-hearted. d. Analogies. There are three analogies in this story. The first is the analogy of the lost son as a sinner. Jesus describes the son’s actions as beyond repair, deserving death and slavery. This describes our condition and our desperate need for a Savior. The second analogy is the eldest son as a religious leader, or someone consumed by law, justice, and duty. This son can’t fathom grace and mercy, and desires justice in punishment and blessing. As is with religious leaders (Pharisees), the eldest son did everything right in his own eyes, and wanted to be rewarded for his action even though his heart was tainted. The father is God the father, always forgiving and receptive to a repentant heart. He longs for all his children to be with him. He knows from afar where we are and runs at the slightest inkling of contrite spirit. In conclusion, this parable not only shows the depths that God would go through for our repentance (social scrutiny, financial loss, breaking all cultural norms). His restoration is incredible – he brings us back into a place of sonship (or daughtership in my case….if that’s even a word), a place we don’t deserve. His joy is overflowing when one of his kids come home. His heart for those living under law is equally torn, pleading with them to accept his theology of grace and mercy. His heart, when we obey, is that we get to relish in all the treasures of heaven. While we are with God, we have access to the entire kingdom, just like the eldest son actually had access to all of his father’s wealth. As popular as this parable is, it is still one of my favorites in displaying God’s incredible heart toward humanity. [ii] DeSilva, David A. Introduction to the New Testament: Context, Methods, and Ministry Formations. Intervarsity Press, Downers Grove, IL, 2004. [iii] www.biblegateway.com Zondervan Corporation, LLC. New York, NY. [iv] Fischer, Dennis. http://searchwarp.com/swa49083.htm. Article on March 2, 2006. I'm 28 years old, married, learning, growing, loving, dreaming, and attempting to document it all.